This is a short guide to getting your virtual machines you made in workstation 9 to working in 8, and possibly versions later in the future. 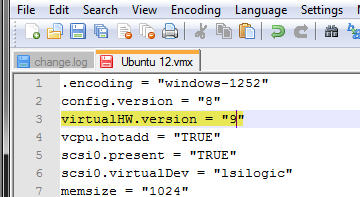 Once the file is open find this line and change the number from "9" to "8"
Save and close the file. Open VMWare and the machine will now work with Workstation 8. I made this because a friend of mine had VMware 9 trial but only a licensed copy of VMWare 8. So after downgrading his VM's did not work. This corrects issue.